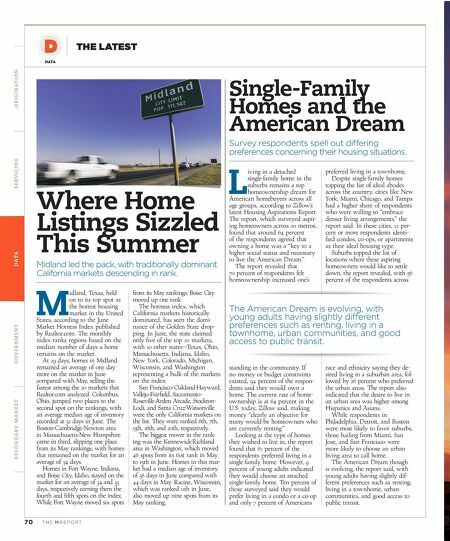 TH E M R EP O RT | 71 O R I G I NAT I O N S E R V I C I N G DATA G O V E R N M E N T S E C O N DA R Y M A R K E T THE LATEST DATA THE LATEST Cities With the Most Long-time Homeowners Locations with loyal residents are in areas outside urban centers. J aunt through just about any established enclave, and you'll likely encounter at least a handful of houses inhabited by long- time homeowners. That said, there are certain areas in which more long-timers tend to congregate, and Trulia set out to locate them. To find these decades-dwelling homeowners, the company analyzed and mapped the median move-in date for residents span - ning the nation at the ZIP-code level in the largest 100 metros. Unsurprisingly, many places with a multitude of long-timers exhib - ited a higher-than-average home- ownership rate. And that makes sense, as renters typically pick up and move more often. Echoing that trend, most of the locales with homeowners who've stuck in the same spot are far from urban cores, Trulia says. Some of the findings: The median move-in year in more rural zones is 2004, the oldest in the sample, the company says. By contrast, it's 2006 in suburban areas and 2007 in urban ones. As for the "oldest" 10 percent of ZIP codes by metro area, rural ZIPs are overrepresented by 54.7 percent, Trulia reports. Suburban and urban ZIP codes, however, are 35.4 percent and 70.3 percent underrepresented, respectively. Numerous metros boasting the biggest concentrations of "long-tenured-resident ZIP codes" have charted sluggish population growth over the past 3.5 decades, with some even losing residents altogether, it found. Pittsburgh, Pennsylvania, one of just seven large metros that has lost population since 1980, contains several of the oldest U.S. ZIP codes. A fair distance from down - town and near the West Bend area, the median move-in year for people in ZIP 15433 was 1984. And get this: 41.4 percent have nested there since 1979 or before. Generally speaking, folks living in Midwest, East, and Northeast metros have stuck at the same address longer than those hail - ing from metros in the Southeast, Southwest, and West, Trulia reports. All but one of the metros recording the highest proportion of people who've called their current residence home since 1979 or before are in the Midwest and Northeast. Honolulu, Hawaii, is the lone Western metro to land in the top 10, while Pittsburgh leads the pack, with 16.9 percent of people in the metro area living in homes they've been in since 1979 or earlier. Rounding out the bottom of the list: Las Vegas, where just 1.5 percent of the population has lived in the same home since 1979 or earlier, Cape Coral and West Palm Beach, Florida, and Phoenix, Arizona. Gauging the Profitability of Selling a Home Median profits from 2017 sales fall short of 20 percent down payments. H ome sellers in 2017 made a median profit of about $39,000 in 2017, according to data Zillow released recently. Having owned their homes for about 8.5 years, their profit return was about 21 percent. With 71 percent of sellers in the market for a new house though, the question remains, "How easy is it for them to purchase a new home at today's prices, even with their newfound returns?" Zillow calculated the typical length of time a 2017 seller owned their home before selling and then found the median price gain on sales in major U.S. metros. It then compared this gain to the price of a 20 percent down payment on a median-priced house in April 2018. At a national level, the $39,000 returns sellers reaped in 2017 were not enough to cover a 20 percent down payment on a median- priced home, which comes to about $43,000, the study found. In fact, in 25 of the 33 metros, Zillow covered profits earned in 2017 fell short of a 20 percent down payment in the same market today. In New York, the nearly 15 percent gain translated to $46,000 in earnings. While that is above the level for a 20 percent down payment at the national level, in New York, a 20 percent down payment is significantly higher, about $84,960. In Chicago, sellers faired similarly, gaining $19,900, which is less than half what is needed for a down payment in the metro— about $43,600. The outliers, where home sell - ers did earn enough to cover a down payment in their market, included a handful of high-priced markets in the West. In San Jose, California, homeowners reaped $296,000 in profit after owning their homes for almost nine years. This was more than enough for a $252,780 down payment on a median- priced home in the area. In fact, this profit was higher than the national median home price. In percentage terms, San Jose ranked highest for median percent change in price between home sales with a 53.8 percent increase. San Francisco (45.5 percent); Seattle, Washington (44.7 per - cent), and Portland, Oregon (37.6 percent) also posted high rates of return. As in San Jose, sellers in these markets can afford a down payment on a median-priced home with the profits earned on the sale of their homes. The good news for the sellers in those markets where they did not earn enough for that 20 percent down payment is their earnings still often give them an edge over first-time buyers. Today's sellers "typically are buyers as well, but the profits from the sale of their former home give them an advantage over first-time buyers who may be coming in with smaller down payments," said Aaron Terrazas, Senior Economist at Zillow. In this world of record number of defaults, complex loss mitigation solutions and changing government regulations, who can you count on to manage your most valuable assets, your customers? The Name You Can Count On in Loan Servicing. 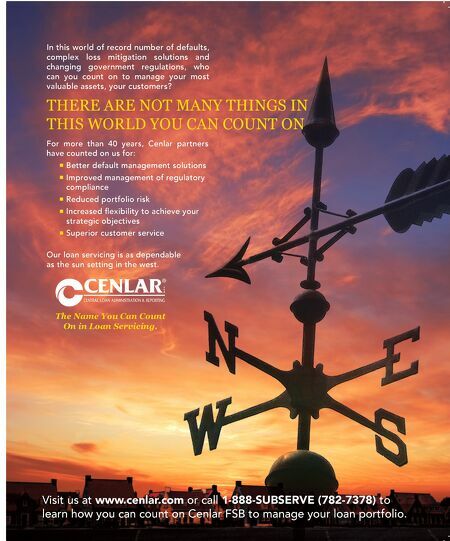 THERE ARE NOT MANY THINGS IN THIS WORLD YOU CAN COUNT ON For more than 40 years, Cenlar partners have counted on us for: Better default management solutions Improved management of regulatory compliance Reduced portfolio risk Increased fl exibility to achieve your strategic objectives Superior customer service Our loan servicing is as dependable as the sun setting in the west. Visit us at www.cenlar.com or call 1-888-SUBSERVE (782-7378) to learn how you can count on Cenlar FSB to manage your loan portfolio.